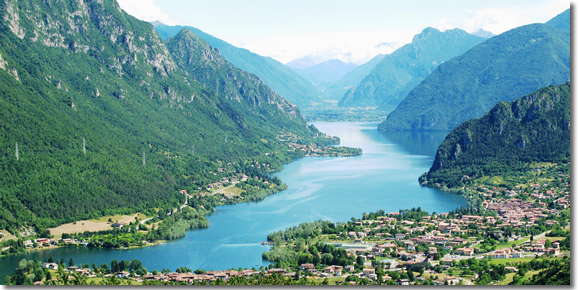 Lago d'Idro is perhaps the downright prettiest of the minor Italian lakes, a mere slip of a pond—not quite six miles long and just over a mile wide, nestled into into the Valle Sabbia—just west of Lake Garda. Lake Idro is renowned for its trout, sailing and kiteboarding, sheer beauty, and in winter the fine skiing in the surrounding mountains. Most of the hotels and services (most of which require at least a two- or three-night minimum stay) are at the south end of the lake in the contiguous villages of Crone and Idro. The town of Anfo halfway up the western shore sports a 16th century castle and church of Sant'Antonio with 15th century frescoes. And that's about it for sleepy little Idro! Idro is just west of Lake Garda, but you have to drive around the mountains to get there: either around to the north from Riva del Garda, or into to south end of Idro from Salò. It's best to drive here, but if you don't have a rental car, the easiest way is by bus (www.trasportibrescia.it) from the big city of Brescia (100 min) or from the Lake Garda town of Salò (55–85 min; change buses in Vestone). Best by rental car, though there is bus service along the lake (www.trasportibrescia.it) as well as a Lake Idro ferry (web.provincia.brescia.it/trasporti/navigazioneidro).